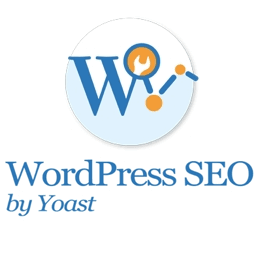 By now you’re aware of the sheer awesomeness of the Yoast WordPress SEO plugin. This guide will help you understand how to properly set up the popular Yoast plugin and ensure optimal indexation of your site with search engines, as well as take advantage of the plugin’s awesome capabilities. We’re excited to help you fully unleash the power of the best WordPress SEO plugin on the planet. Yep, it’s that good. Let’s get started. No matter whether you use the Yoast WordPress SEO plugin or another WordPress SEO plugin such as All-in-One SEO, Platinum SEO Pack or others, I can help ensure that it’s optimized on your website. I have experience optimizing WordPress SEO plugins on 100+ websites for nearly a decade, and for everyone from big publishing brands to small businesses. Each and every time I optimize them, I notice multiple setup errors that are important to fix to help ensure search engines index your website properly. I’ll walk you through as much as I can to help you optimize the plugin to the best of your ability. If you get stuck, remember that I can always help you with one of the service packages above. This is first page to start with after installing the Yoast SEO plugin for WordPress. Unless you have very knowledgeable editors on the topic of search engine optimization, you should keep the “Disable the Advanced…” check box checked. Why? 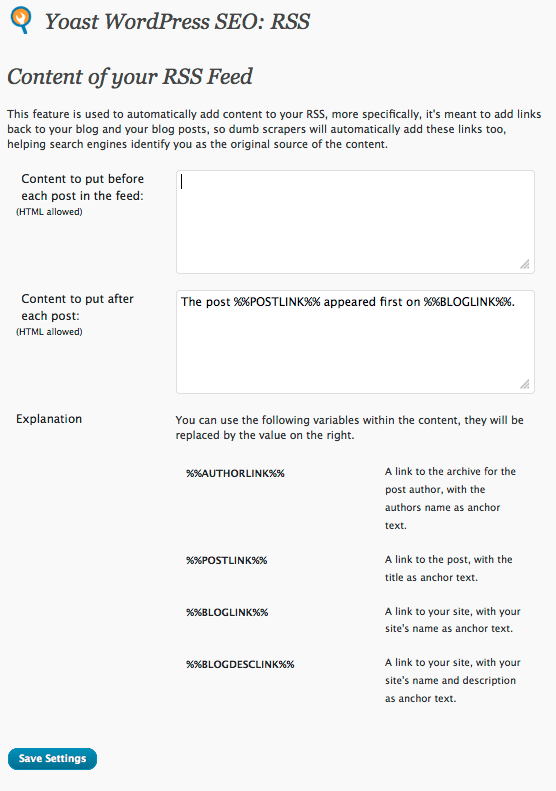 This will allow editors to be able to redirect posts, set them to “noindex,” etc. Very dangerous stuff for an uninformed editorial experimentalist. The other thing to consider on this page is setting your site up in Google Webmaster Tools, Bing Webmaster Tools, and Alexa. There is incredible data there to help you further optimize your website. Set it up. Copy and paste your verification codes and ID’s here as show below. Click every check box unless the “Use meta keywords tag” section if you don’t want you’re targeted keywords to appear in the source code. Search engines don’t use them, but they help you keep track of the keywords you are targeting per page. Some SEO professionals prefer to hide such information from their competitors, although we tend to think that’s really not worth fretting over. It can be a waste of time if you don’t feel you need to keep track of your keywords, however. This section is for your homepage. Fill out Title Template as instructed below, entering a short yet compelling and keyword-rich phrase that summarizes your home page + add the %%sitename%% shortcode to automatically populate your website’s name. We like to use the | symbol to separate the two sections. Be sure to keep the entire meta page title under 65-70 characters, otherwise, it will get cut off in the Google search results. Fill out the Meta Description Template section with a keyword-rich, compelling sales pitch for your homepage. Limit it to 140-150 characters, otherwise it too will be cut off in the Google search results. You can use the Author highlighting section to aid in connecting your blog with your Google+ profile, which can result in your pretty little face showing up next to your blog posts in Google’s search results. This section is pretty easy. You can mostly keep everything the same, but simply check the check boxes to “noindex” and “Hide WordPress SEO” on media pages (i.e. – image attachment pages) which really just create duplicate content bloat for your website…which can lead to Google Panda penalties. You don’t want search engines indexing these pages. The default meta page title settings for Posts & Pages are good since they will put your title first, then page number (if it’s paginated), and then your site name at the end with the | symbol just before it. Keeping it classy…San Diego. Here’s where we need to roll up our sleeves. Your Category pages are important, but they are duplicate content…so they are no different than Tag pages in all reality. However, you link to these pages from your navigation menus (giving them page rank), so give them well-optimized, unique content. Write 100+ word unique descriptions for each of your category pages (enter via Posts > Categories in WordPress). Use keywords and customize the meta data for your category pages. Set “Post Tags” and “Format” to “noindex,” and hide the WordPress SEO Meta Box on these pages (you don’t need it), since you don’t want search engines to index these. They are just more duplicate content bloat that can get you into trouble in a post-Panda world. Tip: Remove “Archives” from meta page title template for Categories & Tags. It just makes you look outdated. If you’re running a one-author blog or website, then just set both “Author Archives” and “Date Archives” to be “noindex,follow” and disable these features. They are just going to get you into more duplicate content trouble with search engines and aren’t really necessary. Also, isn’t it nice to see that search result pages and 404 “not found” error pages are also set to “noindex” for you? Thanks Joost de Valk! 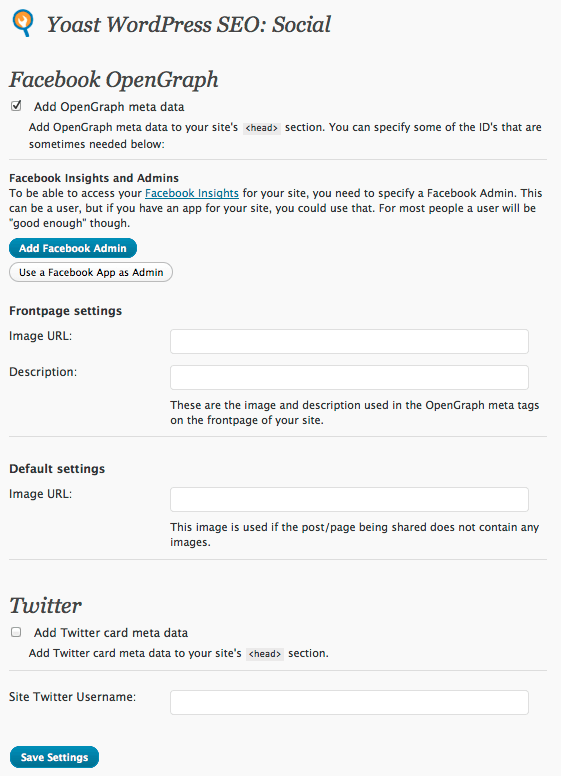 This section allows you to add Facebook & Twitter OpenGraph Meta Data to your site…which helps protect your social media branding! Yaya! No longer will Facebook thumbnails, incorrect titles or descriptions show while sharing your posts on Facebook & Twitter. So, add yourself as a Facebook Admin, add your logo URL, site description, default image URL, click the check box to add your Twitter meta card data and add your Twitter username. This also helps search engines associate your site with your social media accounts…and remember, social signals are HUGE these days. While we tend to like the Google XML Sitemaps plugin a little better (more control), it’s certainly nice to use less plugins. And, this sitemap functionality at least has the essentials (ability to exclude parts of your website that can be seen as duplicate content). 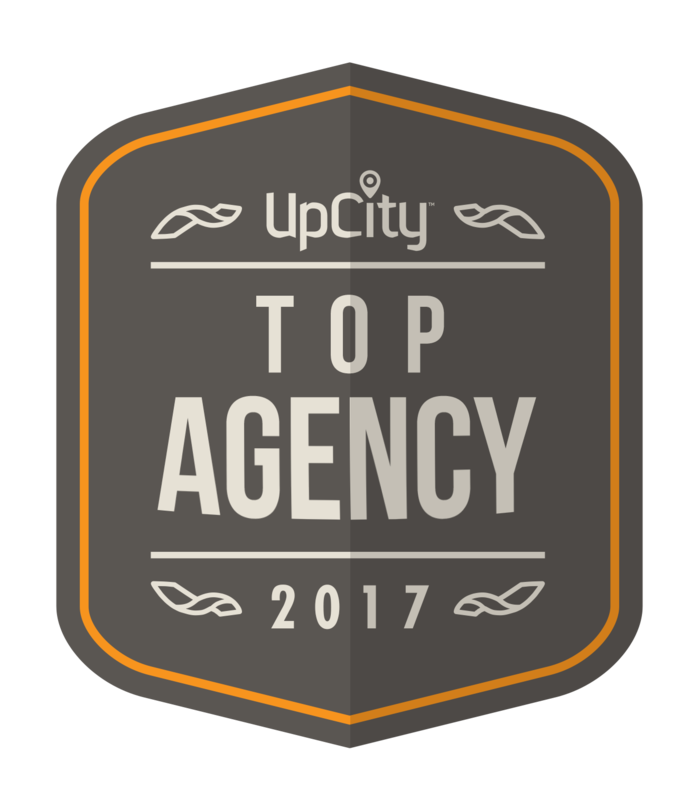 When it comes down to it, you really only want to be asking Google to index your home page, posts, pages, and category pages (which you wrote unique descriptions for…right?). So, check every check box except for Posts, Pages, and Categories. Then, click the “XML Sitemap” button, copy the URL and submit it in Webmaster Tools for your site. Help Google (and Bing) help you. Stop right there. This section is no about cute search engine friendly URLs for your WordPress site. Instead, this section tells search engines how to handle your permalinks. Simply check every check box except for two: “Redirect attachment URLs” (since we’ve already set them to noindex) and “Prevent cleaning out Google Site Search URLs” (since you are probably using WordPress’s built in search functionality). However, if you don’t like “image attachment” pages…you can click the check box to redirect them back to the parent page that they are hosted on. That’s fine. Tip #1: If you are using the “WP No Category Base” plugin to remove /category/ from Category page URLs, then you’ll want to deactivate that plugin. It’s no longer needed! Tip #2: If you are doing eCommerce on a WordPress site (shame on you, it’s not secure! ), then you might want to clarify that the “http” version of your canonical URLs should be used since your site will most likely have both http and https versions of your URLs. Caution: We have noticed problems with the “Strip the /category/ base” feature on sites with the WP-Clear theme. Each day, it seems the setting breaks and this setting must be toggled (checked or unchecked) in order for it to work again. It could end up working even when set to the “off” position. Currently under investigation. This section is for navigational breadcrumbs, which are good for SEO since they help ensure that you show both users (and search engines) links to your other pages within each section. This section takes a little more knowledge, although you can do it. We recommend reading this page on the Yoast website for more information. Joost already covered it nicely. This section is simply awesome. Protect yourself from evil scraper sites by ensuring that you have links to the original posts/pages on your site (plus a link to your home page) from within your RSS feed. Help fight the good fight against duplicate content and keep this page as is. If you’re already using the All-in-One SEO Pack or HeadSpace2 plugins, this section will help you quickly and easily migrate to WordPress SEO by Yoast. Simply check the check boxes to import from either plugin, and also the check box to delete the old data, click Import and then go deactivate the older plugin. Bam! 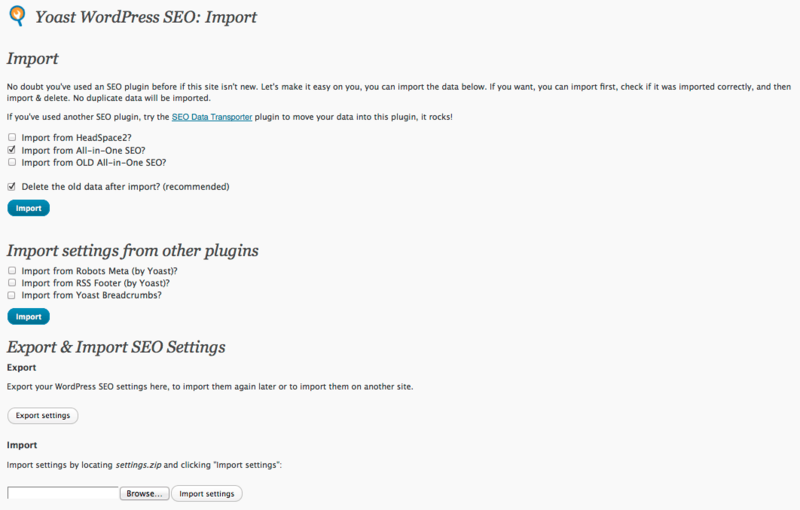 Tip: If you’re a Platinum SEO Pack user, you’ll need to use the SEO Data Transporter plugin. Well, that’s it! Hopefully this helps you get started with using this top notch WordPress SEO plugin. If you have any tips of your own, leave ’em in the comments.